1. Why waste my time designing my ships when I could be kicking the Drengin in the teeth?? 2. I love the ship builder! Unfortunately, my artistic talent limits me to drawing stick figures and making ships with the engines on backwards. 3. I love the ship builder! In fact I'm so good, my ships produce their own influence points because of how cool they look. So I thought maybe it would be a good idea to have a thread where people could post pictures, or descriptions of ships they would like to have... and anyone that's mastered the ship builder, and wants to help the artistically challenged and terminally impatient, can fulfill requests and share their designs by uploading to the library Link, or trade directly with other people. So basically just a ship request/trading thing. I imagine this will be even more fun once people start modding their own ship parts, but I've seen some really cool designs people have done with the existing parts that I would love to have. Or, if this is a bad idea, this thread can begin its slow, painful journey to the bottom of the thread list. This might not be possible, considering most of the parts in the game seem more angular and pointy... but I think there are some rounded pieces, so this might work. I just like the idea of flying around in the old-fashioned ufo-type ships. Might have to use Kryo's ship mod for this one. Also, it would probably be a good idea if you mention what race the ship is for, and whether or not you have the collector's edition parts. 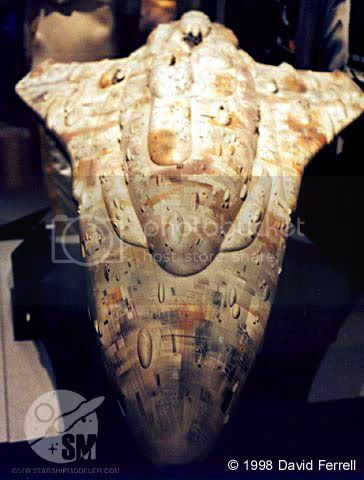 The Mon Calamari cruiser could probably built using the more bulbous basic hulls (like Yor) and simply stacking objects until you can start fine tuning with smaller objects. Remember, most of the cooler ships you've seen here use several clever ways of arranging the standard parts to simulate a single hull. Don't be afraid to alter hardpoints, either. The Close Encounters one could probably faked using the wheels and large versions of the dishes that you'll see in the generic styles. Find a pole-type piece and use that as your basic stem. Then scale the discs up and down to get that tapered feel. Again, the best way to get the correct orientation is to alter the hardpoints by rotating them so that the basic hull is in a vertical orientation rather than horizontal.